Espinosa agreed to a minor-league with the Phillies on Friday. Espinosa will join Triple-A Lehigh Valley. 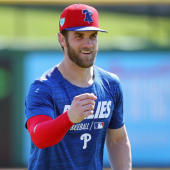 The veteran has been mostly a second baseman in his career, but he has a shot to earn some big-league playing time at third base or shortstop, as the Phillies' haven't gotten much production out of either spot this season. Espinosa isn't a good bet to produce much himself, though, having been last seen posting a .173/.245/.278 line in 93 games for three teams last season. He hasn't posted an above-average batting line since 2011 and has recorded a wRC+ above 80 just once since 2012.